Publishers strive to deliver better and better content to wider range of new readers. 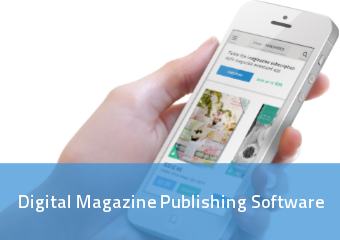 One of the latest piece in their equipment are Digital Magazine Publishing Software. How Digital Magazine Publishing Software can help you grow? Every magazine publisher wants to grow. This is particularly hard in todays economy and with a limited resources. Fortunately there is an easy way to significantly enlarge markets that your company address – and this is mobile. While going mobile may sound tough it really isn't with a help of Digital Magazine Publishing Software. Publishers can test mobile markets spending very little money comparing to building custom solution. Therefore reach new people and grow! Increasing the number of channels publishers can reach new readers is probably number one job today for publishing companies. Apple started mobile revolution in 2010 with release of original iPad and suddenly publishers woke up in a reality where they have to embrace this new medium. Simple Digital Magazine Publishing Software were developed to help publishers focus on delivering content to readers, relieve them of IT headache and dealing with App Store and Google Play Store policies. When you do the math and recap all of the costs, moving magazine mobile can end up very expensive. There all those costs that normally don't occur when you thing about magazine or a newspaper: hiring IT guys, setting up an infrastructure, managing software developers, designing for mobile, UX and UI testing, and so on. Publishers choose Digital Magazine Publishing Software to reduce all this cost, but more importantly to focus on what they do best – creating great and original content for their readers. PressPad is a great example of Digital Magazine Publishing Software. Publishers don't have to learn new software, as it runs in the browser. They don't have to spend time or money on development, because PressPad takes care of that and constantly updates it to a newer version. Finally using tools like that help publishers focus on their job and create outstanding content.